Back in 2002, I worked with a client who was a division administrator with the State of Wisconsin. He introduced me to the concept of “working in your Upper 50%” and it stuck with me. In fact, it is a method I have used with clients ever since. When people really get this, it can be very empowering and gets adopted as discussion norm. What is working in your Upper 50%? As a consultant, one of my functions is to counsel clients on finding and working in their Upper 50%. This requires having a deliberate conversation about what that means. For example, we were helping an emerging life science company build out a new functional area. The VP quickly understood the 50/50 concept and it became a weekly discussion item. The goal was to optimize the VP’s time so, as the leader of Medical Affairs, he could focus on the data and the scientific narrative, creating a medical deployment plan, establishing performance metrics and collaborating with his peers on the go-to-market strategy. The team worked together to find solutions for his Lower 50%. We put a functional implementation plan together that delegated roles and responsibilities for completing prioritized activities. We established content guidance and review processes to delegate development of high-quality, consistent medical materials to the MSL team. 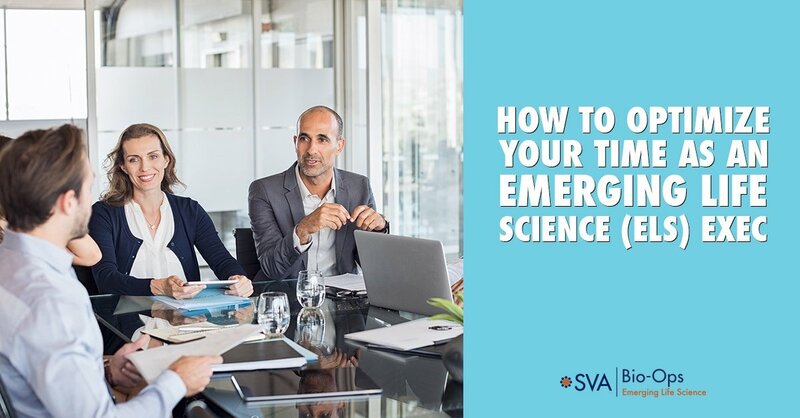 We put a “send and move-on” system in place that he and his managers used to submit ideas, questions and decisions with confidence that a process and team would triage and act on them. This allowed the VP and managers to focus on making decisions and developing cross-functional relationships with other departments and other activities where their time and attention was most needed. 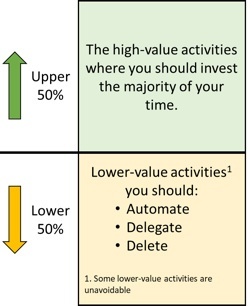 Some people are reluctant about delegating Lower 50% activities. It’s important to understand that it’s not about relinquishing control; one person’s Lower 50% is another person’s Upper 50%. It’s all about getting everyone to play to their strengths. Make the Upper/Lower part of your regular conversations. Want our Biz Tips added to your RSS feed? Just click the button below to subscribe.